From the successful Charcoal Filter Range by Black+Blum, Binchotan active charcoal is used to filter water by absorbing impurities such as chlorine. It has been used by the Japanese for over 500 years and will make your tap water taste great. This range was created to encourage people to stop buying expensive bottled water and adding to the continuing single-use plastic global environmental problem. 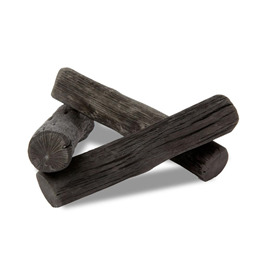 These charcoal refills are pre-washed and vacuum sealed so they are ready for immediate use. Simply drop the charcoal into your water, we recommend one stick per litre, then leave for 1 hour (8 is best) and enjoy your filtered water. Each charcoal will last for 6 months as a water filter, simply recharge after the first 3 months use. They are then recyclable for other uses around the home. They fit in Eau Good, Eau Good Glass, Eau Carafe and all Box Appetit water bottles but can also be used in any jug or bottle. Below are reviews of Black+Blum Charcoal Water Filter - 4 Pack by bodykind customers. If you have tried this product we'd love to hear what you think so please leave a review. These water filters definitely enhance the water, by taking away that tap water taste. I just wish it would work quicker than it does (you need to leave it for at least an hour before drinking to feel the effects) but so far so good.